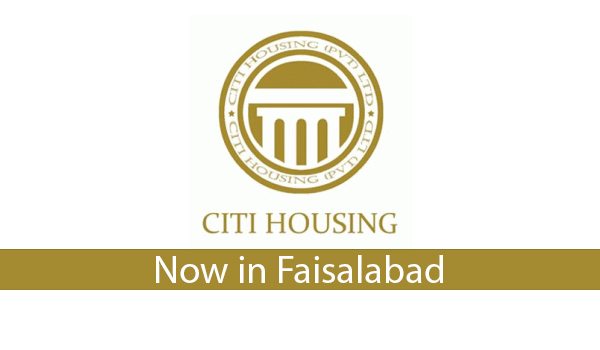 After good success in Gujranwala, Sialkot and Jhelum, Citi Housing (Pvt) Ltd has now hit up Faisalabad with another housing project set to offer gold-standard living to the people of the city. It looks like the developer is focusing on relatively smaller cities, while perhaps deliberately ignoring the major real estate markets of Lahore, Karachi and Islamabad. This could turn out to be a great strategy, given that the smaller markets of the country are nothing to sneeze at either. Whatever the stance of the developer may be, its successes in Gujranwala, Sialkot, and Jhelum have shed ample light on the real estate investment potential of these so-called smaller cities. I think I’ll do an entire post on that subject sometime soon. With the launch of Citi Housing Faisalabad, another investment opportunity opens up for the real estate investors in Faisalabad to consider. Booking of residential plots in the locality is open these days on a first-come-first-serve basis, so you should rush now to book any of the 5- and 10-marla and 1- and 2-kanal plots in the locality on easy instalments of 3 years. *These prices have been sourced from a third party and Zameen.com cannot guarantee their accuracy. Please attempt to independently verify prices before making a purchase decision. Mr Fahad Pervaiz Qureshi of Irtasaam Associates told Zameen.com that the society will be located on Sargodha Road in close vicinity to the Motorway toll plaza and at a kilometre’s distance from FDA City. Mr Qureshi also tells us that development work has begun in the locality and its main entrance is currently under construction. We have also learned that Citi Housing Faisalabad will feature underground electricity supply, availability of Sui gas – which many people might take for granted but is a big problem in Faisalabad, apparently – a school, lush green parks, a zoo, round-the-clock security, minimum 40-foot wide roads, a hospital, health club, and multinational brand outlets. That is all for the day. If you would like to say anything about the launch of Citi Housing Faisalabad, please feel free to do so in the comments section below. We will keep you all posted about the latest developments in Citi Housing Faisalabad as and when they emerge, so stay tuned to Zameen.com!